With the Protogenoi in existence, Ouranos would assert his claim to be supreme deity of the cosmos. There was little opposition to the powerful god from the other Protogenoi, but even so he was fearful of his own offspring. As a result the three Hecatonchires and three Cyclopes, born to Gaia, were subsequently imprisoned in Tartarus, much to Gaia's disgust. Gaia would then give birth to 12 other children for Ouranos, the Titans. Ouranos though, was less fearful of these children than he had been of the others, and so Greek gods and goddess who were the Titans were allowed to roam free. The 12 Titans are generally considered to be six male gods and six female gods; The male Titans were Cronus, Iapetus, Oceanus, Hyperion, Crius and Coeus, whilst the females were Rhea, Themis, Tethys, Theia, Mnemosyne and Phoebe. The decision of Ouranos to leave these Greek gods and goddess free proved to be a costly mistake, for Gaia would incite them to rise up against their father. 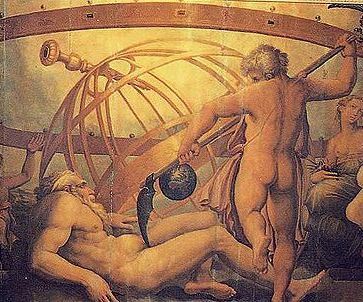 Ultimately, when Ouranos descended from the heavens to mate with Gaia, Iapteus, Hyperion, Crius and Coeus held down their father at the four corners of the earth, whilst Cronus wielded an adamantine sickle to castrate Ouranos. Ouranos would retreat back to his domain, with much of his power no gone. Cronus, having been the only Titan willing to wield the sickle, would then take up the position of supreme deity of the Greek pantheon. The male Titans then married one of his sisters. The pairings were generally considered to be Cronus and Rhea, Oceanus and Tethys, Hyperion and Theia, and Coeus and Phoebe, whilst Iapetus, Crius, Mnemosyne and Themis were unpaired. The Titans, or Elder gods as they were also named, would be in charge of a particular area of the cosmos and life. For example, Ocenaus became linked with water, Hyperion with light, Mnemosyne with memory, and Themis was linked with justice. Under the Titans everyone prospered, hence the period being named as the "Golden Age". During this Golden Age, the Titans started to reproduce, and a number of offspring were born to the various couples; and many of these children would become known as second generation Titans. Amongst the most famous of second generation Titans were the four sons of Iapetus, who were Prometheus, Epimetheus, Atlas and Menoetius; the three children of Coeus, Lelantos, Leto and Asteria; and the three offspring of Hyperion, Helios, Eos and Selene. Cronus was no more secure in his position than his father had been, and rather than releasing the Hecatonchires and Cyclopes he angered his mother by keeping them imprisoned. Nor was Cronus so unwise as to allow his own children to roam free, and each time Rhea gave birth, Cronus would swallow them, imprisoning them in his stomach. Gaia and Rhea though conspired against Cronus, and when the sixth child, Zeus, was born, instead of allowing him to be imprisoned, they pair of goddesses secreted him away on Crete. Zeus would grow more up, and become powerful, and soon he was in a position to revolt against Cronus; and the son of Cronus would release his siblings from their imprisonment, as well as the Hecatonchires and Cyclopes from Tartarus, and so a ten year war would begin between Zeus and his allies, and the Titans. 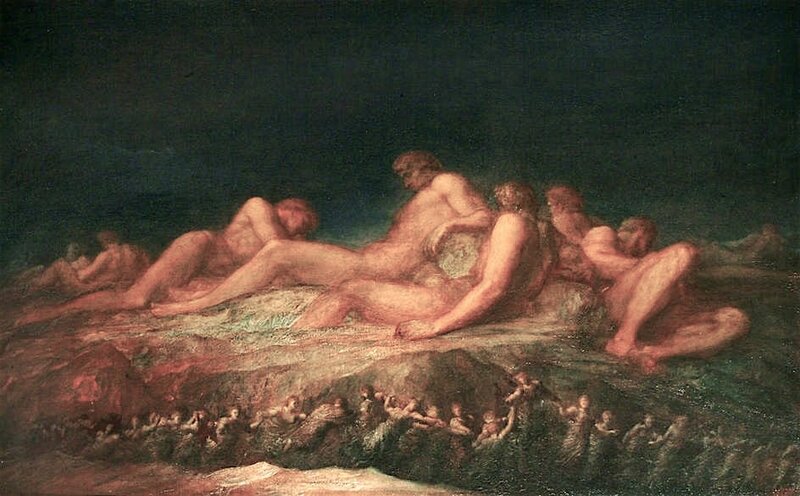 Ultimately the Titans would lose and many would be banished for eternity into Tartarus themselves, whilst the cosmos was then divided amongst Zeus, Hades and Poseidon.